This Bonfire Night (Friday 5th November) and the days following it there are plenty of displays across the county to keep the family entertained, a few of which we have picked out below (of course there are even more listed online at The Essex Chronicle). Once you have decided which of the fantastic displays you’ll be attending, it’s time to answer the next big question – what to wear? Fortunately The Liberty Shopping Centre is on hand to help! Dressing for Bonfire Night is all about layers, slouchy silhouettes and keeping warm – but there’s no reason not to do it in style! From cosy cardigans, chunky jumpers and snug scarves, you can make sure your outfit is as bangin’ as the fireworks with a little help from The Liberty. Keep out the cold with this diamond-print poncho (£35) from Accessorize, designed with a faux fur collar and a softly draped handkerchief hemline. Exude an off-duty cool in this relaxed and snuggly, classic Christmas knit jumper (£35) from M&S. A key style for Autumn/Winter 2015 is feminine, thigh skimming over the knee boots, like these new Esme block heel suede boots (£35) from Office. Pair with thick tights for toasty toes and a high(ish) hemline. The high collar, hood and lining of this microfibre coat (£50) from Next, mean you’ll stay super snug plus the nipped in waist will keep you looking tres chic PLUS it’s waterproof should the British weather let you down! Amp up the accessories with these soft camel leather gloves (£16) from Debenhams, featuring knitted palms for extra comfort. Top off your look with this cute beanie hat (£14) from Topshop, complete with faux fur pom pom and available in a number of autumnal shades. 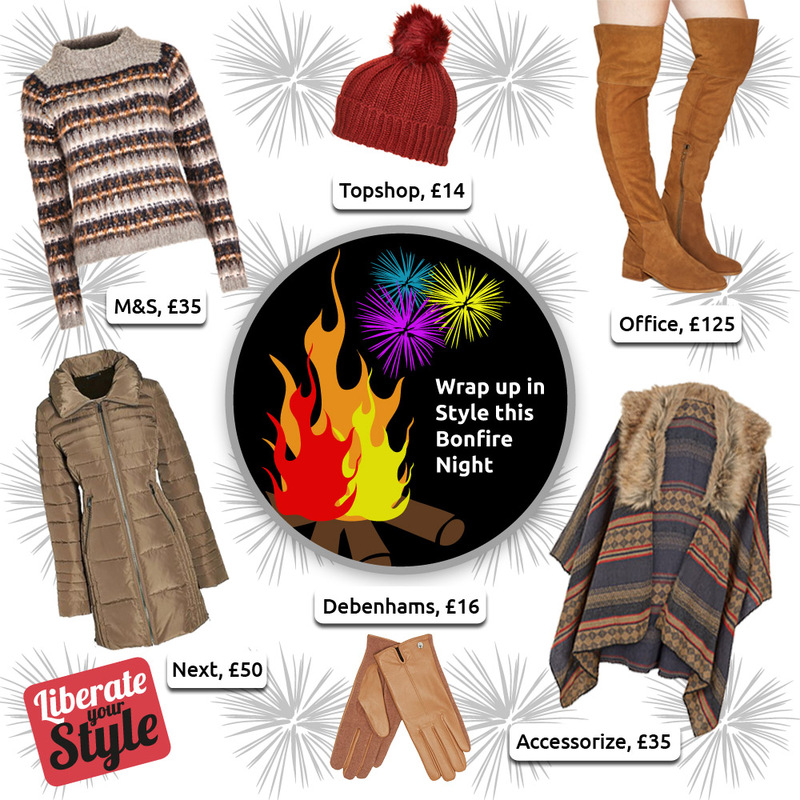 Why not share you bonfire night style pictures with us on Facebook, Twitter, Pinterest or Instagram, using the hashtag #LiberateYourStyle?